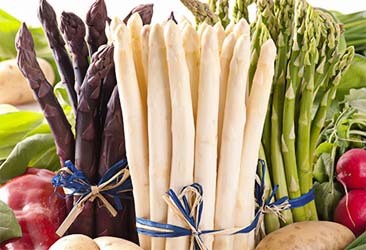 There are three basic types of asparagus: green asparagus, white asparagus and purple asparagus. The most familiar sight you will see on shelves is the green asparagus. It got its color from the process called photosynthesis where plants convert the energy it gets from the sun into fuel or energy. This conversion is associated with the green pigment chlorophyll where the green asparagus got its color. When cooked properly, the color of the green asparagus becomes even greener and brighter, its texture crisp yet tender. Speaking of tender, one common misconception about asparagus is with regard to is size. People believe that the thinner the spear, the younger the asparagus, therefore the more tender it is. But this is not true. The fact is that the thicker the asparagus, the tender its texture is. That’s because asparagus has a fixed set of fiber which is not so obvious in thicker spears. White asparagus is exactly like the green kind except for its color alone. Typically, asparagus turns pink as it sprouts from the ground and when fully exposed to the sun, turns a full green. White asparagus is white because it is grown in the dark. This type of asparagus is more expensive than the green ones—the price is almost double in fact—because it’s hard to come by and because of the high cost it takes to produce it. In Europe, white asparagus is considered a delicacy. This variety is of a totally different kind, not just because of its color but also because of its content. Because it has high levels of the antioxidant, anthocyanin, the spear of the purple asparagus is well, purple. It is also more tender compared to the green and white kind because it has less fiber. It is also sweeter because of its high sugar-content.